For over a decade, we’ve been proudly serving local Floridians and Apple users from all over the United States. We are a family-owned business who understands how important your device means to you and that giving your device to a stranger for repairs can be daunting. That’s why we go above and beyond for our customers, earning their trust with every repair and sale. 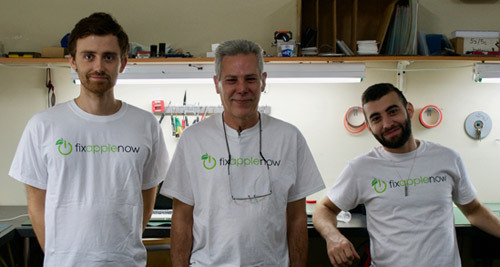 Fix Apple Now is a team of talented techs with a passion for fixing iPhones, iPods, iPads & Macs in record time. We’re a small business that believes in helping a big audience of Apple users, regardless of the issue. Our certified techs have keen knowledge and attention to detail for a variety of repairs, including data recovery, logic board repairs, synchronization, LCD repairs and water damage. We provide quality service and also offer an inventory of refurbished, like-new Apple products and brand-new accessories. We are passionate and committed Apple experts with a combined 15+ years of repair experience. Our team believes that honesty, integrity and privacy should be adhered in every aspect of our business and we promise to be responsible, ethical and diligent in all that we do with the utmost pride. It’s important that we face challenging solutions with focus and precision and never walk away without offering a solution to our customers – even when all hope is lost. We'd love to hear from you. Whether you want to learn more about our services, or just to say hello. Let's connect!